Objectives To develop a quantitative historical job-exposure matrix (JEM) for rubber dust, rubber fumes and n-Nitrosamines in the British rubber industry for 1915–2002 to estimate lifetime cumulative exposure (LCE) for a cohort of workers with 49 years follow-up. Methods Data from the EU-EXASRUB database—rubber dust (n=4157), rubber fumes (n=3803) and n-Nitrosamines (n=10 115) collected between 1977 and 2002—were modelled using linear mixed-effects models. Sample year, stationary/personal measurement, industry sector and measurement source were included as fixed explanatory variables and factory as random intercept. Model estimates and extrapolations were used to construct a JEM covering all departments in both sectors of the rubber manufacturing industries for the years 1915–2002. JEM-estimates were linked to all cohort members to calculate LCE. Sensitivity analyses related to assumptions about extrapolation of time trends were also conducted. Results Changes in rubber dust exposures ranged from −6.3 %/year (crude materials/mixing) to −1.0 %/year (curing) and −6.5 %/year (crude materials/mixing) to +0.5 %/year (finishing, assembly and miscellaneous) for rubber fumes. Declines in n-Nitrosamines ranged from −17.9 %/year (curing) to −1.3 %/year (crude materials and mixing). Mean LCEs were 61 mg/m3-years (rubber dust), 15.6 mg/ m3-years (rubber fumes), 2483.2 µg/m3-years (n-Nitrosamines sum score), 18.6 µg/m3-years (N-nitrosodimethylamine) and 15.0 µg/m3-years (N-itrosomorpholine). Conclusions All exposures declined over time. Greatest declines in rubber dust and fumes were found in crude materials and mixing and for n-Nitrosamines in curing/vulcanising and preprocessing. This JEM and estimated LCEs will allow for evaluation of exposure-specific excess cancer risks in the British rubber industry. This paper is the first to develop a quantitative historical job-exposure matrix (JEM) describing historical (1915–2002) occupational exposures (rubber dust, rubber fumes and n-Nitrosamines) exposures for both the British tyre production and general rubber goods manufacturing. All exposures declined over time. 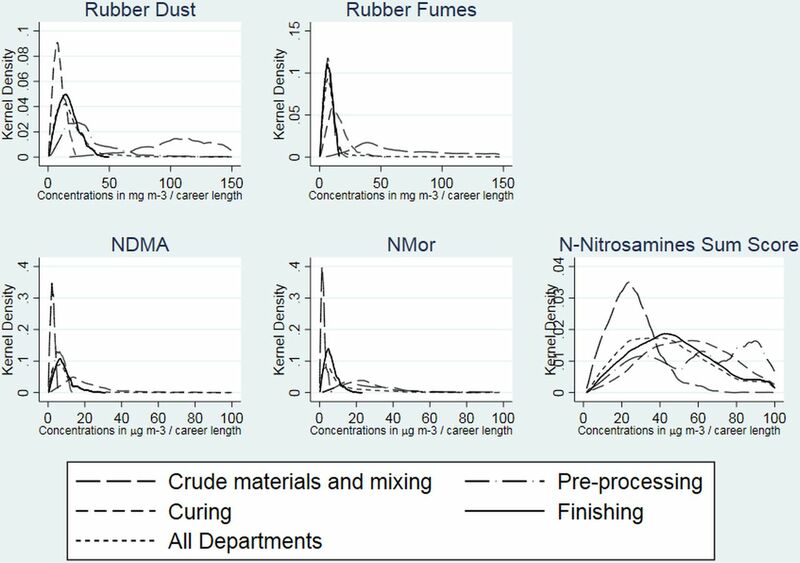 Greatest declines in rubber dust and fumes were found in crude materials and mixing and for n-Nitrosamines in curing/vulcanising and preprocessing. The estimated lifetime cumulative exposure (LCE) based on the JEM for this cohort appeared to be relatively insensitive to choices on extrapolation of time time-trends beyond the range of the measurement data. The JEM enabled estimation of exposure-specific LCE estimation for a cohort of British rubber manufacturing workers with 49 years of follow-up for mortality. How might this impact on policy or clinical practice in the foreseeable future? This JEM and estimated LCEs allow for evaluation of exposure-specific excess cancer risks in the British rubber industry. To evaluate the association between lifetime cumulative exposures (LCEs) to specific occupational exposures encountered in the rubber industry and cancer mortality, we have updated a cohort study of UK rubber manufacturing workers established in 19676 up to 2015 (l 49 years mortality follow-up). External Standardised Mortality Ratio analyses of this updated cohort are presented in a companion paper.7 In this paper, we present the methodology for the development of a historical, quantitative, job-exposure matrix (JEM) covering the cohort members' employment period (1915–2002), and which serves as the basis for a quantitative evaluation of cancer mortality risk and assessment of exposure-response associations to the specific carcinogens rubber dust, rubber fumes and n-Nitrosamines. This study represents the first historical quantitative JEM approach with estimations of LCE for a UK rubber manufacturing worker cohort. In the EXASRUB dataset, jobs and tasks were classified based on the hierarchical BRMA classification.4 To enable estimation of longitudinal JEMs, comparable departments were aggregated into four groups (frequencies in online supplementary table S5): ‘Raw Materials and Mixing’ is composed of BRMA job codes 1 (crude materials and storage) and 2 (compounding and mixing); ‘Pre-processing and Assembly’ comprises BRMA job codes 3 (solutions, cements, latex and foam processing), 4 (extrusion, calendaring and stock preparation) and 5 (component building and assembly); ‘Curing/Vulcanising’ is composed of BRMA job code 6 (curing or vulcanizing) and ‘Finishing, Assembly and Miscellaneous’ is composed of BRMA job codes 7 (inspection, painting, finishing repairs), 8 (storage of finished goods, packing, dispatch), 9 (site workers, drivers, cleaners, laboratory control), 10 (engineering services, building maintenance) and 11 (non-process workers in the factory environment). Other covariates in the statistical modelling were year of sampling, industry sector (tyre production or general rubber goods (GRG) manufacturing) and stationary or personal sampling. For rubber dust and fumes, an indicator variable for the measurement source, that is, BRMA or HSE-NEDB, based on previous evidence,3 and for n-Nitrosamines, a variable to indicate whether measurements were from the UK or Germany were included. Other exposure determinants (like measurement device and strategy) or individual behavioural or lifestyle factors such as PPE were unavailable in the EXASRUB database. We modelled the log-transformed concentration of each agent using a linear mixed-effect model with sample year and industry sector and a random intercept by factory (Eq. (1)). where yij =loge concentration in mg/m3 for rubber dust and fumes, NDMA, NMor and nitrosamines sum score for i=1, 2,…, ni factories and j=1, 2,…, nj measurements nested within factories; β0 =intercept; β1SAMPLEYRij =fixed effects of the time trend; β2SECTORij=fixed effects of the industry sector; β3PERSONALij=personal or stationary measurement; β4SOURCEij =fixed effect for source of measurement (BRMA/HSE for rubber dust or fumes and UK/Germany for n-Nitrosamines); uj=random intercept adjustment for measurements at the same factory and εij residual variance. Last, these model estimates were used to derive a quantitative, historical JEM by transforming back from log-space to provide estimates of GM exposure for each agent, industry sector, department and year combination. These personal exposure estimates were subsequently linked at an individual level to the cohort of workers employed for at least 1 year in rubber factories in Great Britain on 1 February 1967 (n=36 441); more on the study cohort can be found in the companion papers.7 14 For each worker, LCE was calculated by summing the exposure level to each agent from the start year of employment to the retirement year (assuming each worker retires at age 70) and is expressed as mg/m3-years for rubber dust and fumes and μg/m3-years for n-Nitrosamines, respectively. All analyses were conducted in Stata 14.2 (Stata, release 14, 2018). Numbers of measurements per department and year for the exposures are shown in online supplementary tables S1–S3. Estimates for rubber dust were based on 4157 measurements collected in 1977–2002 (11.3% below LOD), of which 58% were personal measurements. 91% of measurements were from BRMA and 61% were from the tyres industry. The number per department group ranged from 606 to 2005 (table 1). Results of the linear mixed effects models are provided in online supplementary tables S4–S8. GM for rubber dust was 0.58 mg/m3. GM levels in crude materials/mixing and in finishing (0.41 mg/m3) were on average about 25% higher than in preprocessing/assembly and curing. Average exposure was more than 2.5 times higher in GRG compared with tyres production and was also higher in HSE-collected measurements than in those collected by the rubber manufacturing industry (2.71 mg/m3 vs 1.76 mg/m3, respectively). Exposure declined by about 6% (95% CI −5% to −8%) annually in Crude Materials/Mixing and was −1% per year in the other departments (online supplementary table S9). Conversely (table 2), JEM estimates indicated average exposure levels of 50 mg/m3 from 1915 to 1935 (capped), followed by a decline from 37.5 mg/m3 in 1940 to 0.7 mg/m3 in 2002 and from 50 mg/m3 to 1.1 mg/m3 in Crude Materials/Mixing department, tyres and GRG production sectors, respectively. In Pre-processing/Assembly, average exposure declined from 1.0 to 0.3 mg/m3 in tyres and 1.5 to 0.5 mg/m3 in GRG; in Curing from 0.8 to 0.3 and 0.9 to 0.4 mg/m3, respectively and in Finishing from 1.6 to 0.6 and 1.0 to 0.3 mg/m3 in tyres and GRG, respectively. GM rubber fume exposure in the GRG sector was 0.26 mg/m3, based on 3803 measurements (66% personal) collected between 1977 and 2002 of which 21.9% were below the detection level and had to be imputed. Thirty-four per cent of measurements were from the HSE-NEDB database, with average exposure levels approximately 3.5 times higher than for those collected by the BRMA. Average exposures were 2.3 times higher in GRG compared with tyres production and ranged from 0.16 mg/m3 in Pre-processing/Assembly to 0.34 mg/m3 in Curing. Time trends across departments were more variable than for rubber dust, and were −7% (95% CI −5% to −9%) annually in Crude Materials, −3 %/year (95% CI −5% to +0.01%) in Pre-Processing/Assembly, −2 %/year (95% CI −0.4% to −0.9%) in Curing, and +0.5% (95%CI −2.2% to 3.2%) in Finishing (online supplementary table S9). Conversely (table 2), JEM estimates of average exposure declined from 50 mg/m3 (capped 1915–1977) in 1915 to 0.2 mg/m3 in 2002 in the crude materials department group in sectors. In the other department groups, average exposure declined from 0.9 to 0.1 mg/m3 and 0.8 to 0.1 mg/m3 in tyres and GRG, respectively (Pre-Processing); from 1.5 to 0.2 mg/m3 and 2.1 to 0.3 mg/m3 in Curing and was relatively stable 0.1 to 0.2 mg/m3 in Finishing. A total of 2023 measurements were available that allowed for combining of individual Nitrosamines (sum score) collected between 1983 and 2001 and of which 88.7% and 85.7% were <LOD, of which 4% were from the UK (see table 1). Fifty-four per cent of these were personal measurements, with average exposure comparable to stationary measurements (0.57 and 0.54 µg/m3, respectively). Average exposure was about 4.5 times as high in the GRG compared with the tyres industry, and highest average exposure was found in Curing (0.72 µg/m3). Average trends over time (online supplementary table S9) indicated reductions of 1.3% in the crude materials departments to as much as 18% annually in curing for the sum score (table 3). No significant exposure reductions were observed for individual nitrosamines, with the exceptions of NDMA in curing (−6 %/year) and NMor in pre-processing (−4 %/year) (table 4). LCE of the cohort of 36 441 workers (59% in GRG) is shown graphically in figure 1, with summary statistics in online supplementary tables S10–14. Rubber dust LCE ranged from 1.5 to 2068 mg/m3-years, which was higher in people working in GRG compared with tyres production (maximum LCE 1661 mg/m3-years) and was highest for workers in Crude Materials/Mixing compared with those in other departments. LCE to rubber fumes ranged from 1 to 796 mg/m3-years, comparable in the GRG (0.6–796.3 mg/m3-years) and tyres sectors (0.6–698.0 mg/m3-years) and was highest for those workers in the Crude Materials/Mixing (7.2–796.3 mg/m3-years). LCE to rubber dust, rubber fumes and n-Nitrosamines. LCE, lifetime cumulative exposure; NDMA, N-nitrosodimethylamine; NMor, N-nitrosomorpholine. NDMA-LCE was higher than NMor-LCE and ranged from 1 to 949 µg/m3 compared with 0.3 to 125.3 µg/m3, respectively, but was comparable for GRG and tyres production. Whereas NDMA LCE was highest for workers in the curing departments, LCE to NMor was highest in workers in the preprocessing and assembly departments. Temporal trend in rubber fumes ranged from +0.5 %/year to −6.5 %/year in different department groups, which was roughly comparable to the overall −2.9% and −4.8% per year, depending on the data source, has been reported previously.3 Differences are likely the result of varied modelling strategies, including larger grouping of departments in our study, which used fewer groups aggregated from different departments, and the fact we used separate models for these department groups instead of estimating from one shared model. There are several limitations to this analysis. First, measurements were not uniformly collected and were a compilation of data collected for compliance testing, research or due to worker complaints. We adjusted for personal/stationary measurement type and for source of the data, similar to previous work, but nonetheless this may still have resulted in residual errors in estimates of central tendency because of exposure affecting factors not taken into account. Unequal numbers of measurements from each factory over time may also have affected estimates of the time trends because factories contributed different numbers of measurements each year. However, this will have been to some extent negated by the use of mixed-effects models which accounted for clustering of measurements in factories. Although previous work on grouping strategies for exposure assessment in the rubber industry indicated grouping based on department would be preferable over exposure-determinant based assessment,20 this would have resulted in measurement error from not taking into account impact of control measures, such as installation of local exhaust ventilation or other group-level or individual-level determinants that could have affected exposures.3 20 We imputed measurements<LOD with a single value assuming a uniform distribution. Simulation studies indicate that this may bias estimates of variability,21 but since we were only interested in an estimate of central tendency for the JEM, the impact on LCE is expected to be minimal. To develop a longitudinal JEM, n-Nitrosamines measurements from Germany were used to supplement the low number of measurements from the UK, which was based on previous comparisons that indicated no evidence of significant differences between both countries.9 Comparison of the data that we do have for the same years from both countries was used to provide an adjustment factor, but it is unknown whether this factor would have changed over time. Models were extrapolated backwards from the first available data in the late 1970s to early 1980s using linear extrapolation of time trends (although capped to avoid unrealistic estimates). Due to lack of quantitative information about exposures in earlier years (1915–1970s), we do not know whether these assumptions are broadly correct, but sensitivity analyses comparing LCE quartiles capped and uncapped show the impact on LCE for epidemiological analyses to be minimal (data not shown). This is because workers who are in the highest quartiles while capped are also in the highest quartiles uncapped and the proportion of data from the highest quartile is 15.7%. Additionally, the proportion of person years contributing to the LCEs from before 1960s was below 10% (data not shown). The authors would like to thank Professor Martie Van Tongeren for information regarding UK JEMs. We would additionally like to thank staff at the Health and Safety Executive, The University of Manchester and the Institute of Occupational Medicine for computerising the many thousands of study cards. IARC Working Group. Chemical agents and related occupations IARC monographs of the evaluation of carcinogenic risks to humans. Lyon, France: IARC, 2012.
. Mortality in the British Rubber Industries 1967-76. London: Health and Safety Executive, 1980.
. Cohort study of workers in the British rubber industry: Mortality follow-up extended to 49 years. Occup Environ Med 2018;75:848–55. EPA. Practical Methods for Data Analysis EPA QA/G-9 QA00 Update. 2000 https://www.epa.gov/sites/production/files/2015-06/documents/g9-final.pdf (last accessed 06 Dec 2017).
. Lifetime exposure to rubber dusts, fumes and n-Nitrosamines and cancer mortality in a cohort of British rubber workers with 49 years follow-up. Occup Environ Med 2019;76:250–8.
. Nitrosamines and rubber. In: Bartsch H , O’Neill IK , Castegnaro M , Okada M . eds. N‐Nitroso compounds: occurrence and biological effects. Lyon, France, 1982:231–43. Contributors FdV, DMM, JWC and RMA conceived of the study and obtained funding. All authors contributed to the study design. DMM, FdV, PR, WM and AD contributed to the acquisition of data. MH conducted the statistical analyses. All authors contributed to the analysis and interpretation of data. MH and FdV drafted the first version of the manuscript. All authors critically revised the manuscript and approved the final text. Funding This study was funded by Cancer Research UK (C29425/A16521). Additional funding for tracing of the cohort was provided by the UK Health and Safety Executive (PRJ787). Disclaimer The views expressed are those of the author(s) and not necessarily those of CRUK or HSE. Data sharing statement The exposure data used in this project were collected within the European Union Framework Programme 5 (QLK4-CT-2001-00160, QLK4-CT-2002-02786). They can be requested from Professor Kromhout (Utrecht University, the Netherlands; 55124612300).